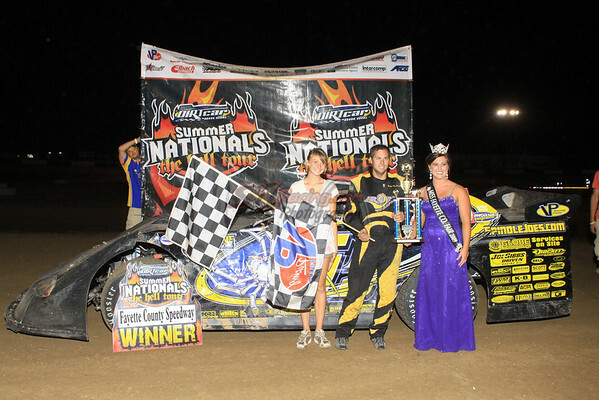 Home > Divisions > Late Models > Jeep VanWormer takes Fayette County Speedway UMP DIRTcar Summer Nationals win! Jeep VanWormer takes Fayette County Speedway UMP DIRTcar Summer Nationals win! CLICK HERE FOR MORE PHOTOS FROM FAYETTE COUNTY SPEEDWAY! Brownstown, IL – July 6, 2010 – Jeep Van Wormer started the second half of his DIRTcar Summer Nationals tour the right way winning night 19 Tuesday night at Brownstown Speedway. Van Wormer of Pinconning, Mich., led all 40 laps of the A-main to claim his third win of the 2010 Hell Tour. Van Wormer started on the pole and built large leads in traffic on his way to claiming the $5,000 winner’s check. Van Wormer would be challenged at points by Jason Feger of Bloomington, Ill., but would eventually prove too strong. The 2009 DIRTcar Late Model National Champion Feger would hang on to second place as seventh-starting Jack Sullivan of Greenbriar, Ark., would climb to third. Current point leader Dennis Erb Jr. of Carpentersville, Ill. would finish fourth as Billy Moyer Jr. would round out the top five. Up next for the DIRTcar Summer Nationals Tour is a visit to Spoon River Speedway on Wednesday July 7, 2010. In total the Hell Tour has traveled over 3,750 miles in the course of 20 nights. The trip from Brownstown to Spoon River Speedway in Canton, Ill., will have drivers traveling nearly 155 miles northwest to the track which last hosted a Summer Nationals event in 2008.